Assembling a new planter with fresh potting soil and young plants is a feel-good activity similar to moving into a new home. Each pot and property is full of promise. Placing a single plant or a grouping in the right size of pot is like selecting a starter home for it that will encourage healthy growth. The type of material a pot is made from also may affect development. Especially when potting perennials and shrubs that eventually become large, containers need to be sized up as the plants grow. However, a common error that can kill a plant is to place it in a container aimed at accommodating the plant's size at maturity. A good rule of thumb for potting a plant by itself is to start with a container that is about one-third larger than the plant's root ball. The plant has the right amount of space and soil to stretch its roots and grow until it is ready to move up to a bigger container and more soil. Plants act like pumps with roots sucking up moisture and foliage releasing it. This process is called capillary action. A plant's root ball is too small to keep up with this work if its container is too big. Evaporation and gravity may be insufficient to drain excess water from potting mix that isn't occupied by roots. The result is overwatering, a condition in which plant roots can't get the oxygen they need due to being smothered by water. Overwatering can also occur if you water a right-sized container too frequently. Sizing up also may be necessary when growing a group of Salvias and companion plants together in a larger container. One sign of overcrowded roots is when a pot dries out rapidly. For more information about how to size up and repot, please watch our video Repotting Salvias: The Basics. Plant pots used in home gardens are made from many kinds of materials, including both porous terracotta, non-porous glazed ceramic clay, plastic and, occasionally, fabric (tote-like "grow bags" or "root bags"), metal and wood. In a semi-arid climate, plastic, ceramic and metal pots may be good choices because they retain moisture better than terracotta or wood. We don't use grow bags, but have heard that although they are designed to aerate plant roots, they may not be appropriate for use on hard surfaces, such as balconies or patios. Depending on bag design, moisture may linger at the bottom of these bags unless they sit on ground that can wick the water. At Flowers by the Sea, we prefer simple terracotta planters with bottom drain holes for groupings of container plants. It's our experience that plant roots are better aerated in these porous clay pots that allow moisture to wick through their walls as well as drain through bottom holes. Even though California is suffering from an extreme shortage of snowmelt and rainfall, we live in a coastal climate with humidity. Also, many of the Salvias and companion plants we grow perform best when their soil dries somewhat between waterings. Self-watering planters are a water-conserving choice for plants that need consistently moist soil. Many kinds are made of plastic. They have two levels, the second of which is a reservoir at the planter's base. Soil in the upper level wicks up water, feeding roots without exposing foliage to overhead spray that can lead to mildew-type problems. While self-watering planters aren't appropriate for drought-resistant Salvias that like potting mix on the drier side, they may work well in dry climates for water-loving Salvias. These include species such as the Anise-Scented Sages (Salvia guaranitica spp.). At FBTS, we sell plants, not pots. We aren't going to pretend to be decorators skilled at setting up artistically arranged groupings of containers, although we have definite ideas about how to put together plants in containers and offer you shortcuts to planning container gardens as well as a per-plant discount though our Garden Kits program. Similar to in-ground plantings, container groupings look better when organized in odd numbers, such as threes or fives. A grouping based on same-sized containers is blah; it's best to vary height, volume and shape a bit. A grouping of containers in varying sizes -- but all in the same color -- is dramatic. Monochromatic displays of flower color also stand out. Imagine cobalt blue containers filled with magenta-flowered Salvias. Neutral colored containers are fine, but sometimes it's fun to draw attention to a single favorite plant by placing it in a brightly colored planter. 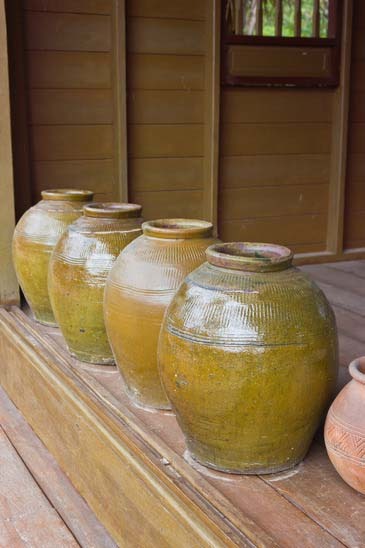 A grouping of pots at the bottom of a staircase is good for marking a transition. Smaller plants and pots are good for tiny areas but seem to disappear in large spaces, such as spacious decks or verandas. Chaotic combinations of plant and pot colors lack focus. It's okay to be as chaotic as you like; it's your garden. While perusing various websites about repurposing unusual objects in gardens, we discovered a rusty old bicycle with shallow-rooted plantings -- imagine various colors of Scarlet Sage (Salvia splendens) -- tucked into pots in its baskets and saddlebags. It was planted, so to speak, in the middle of a flowerbed. This leads us to one last observation: A little bit of whimsy goes a long way. An old cast-iron bathtub filled with kitchen herbs, including cooking sages, is fine as long as you don't plant it next to a toilet bowl overflowing with flora. But as we said earlier, it's your garden. How you contain it is up to you. We'll be here, however, if you have any questions. Just call or send us an email. Who knew? While researching an article about flowerpots, we went looking for songs about flowerpots and discovered The Flowerpot Men an early Beatles-era British rock band whose 1967 video appears here. Perhaps they took their name from the 1950s BBC children's puppet show Bill and Ben, The Flower Pot Men. Who knows? They are part of a long list of bands with garden-related names, some of which follow. Want to add a name? Please leave a comment. Thanks to Steve Hoffman Music Forums and for helping to grow this list.